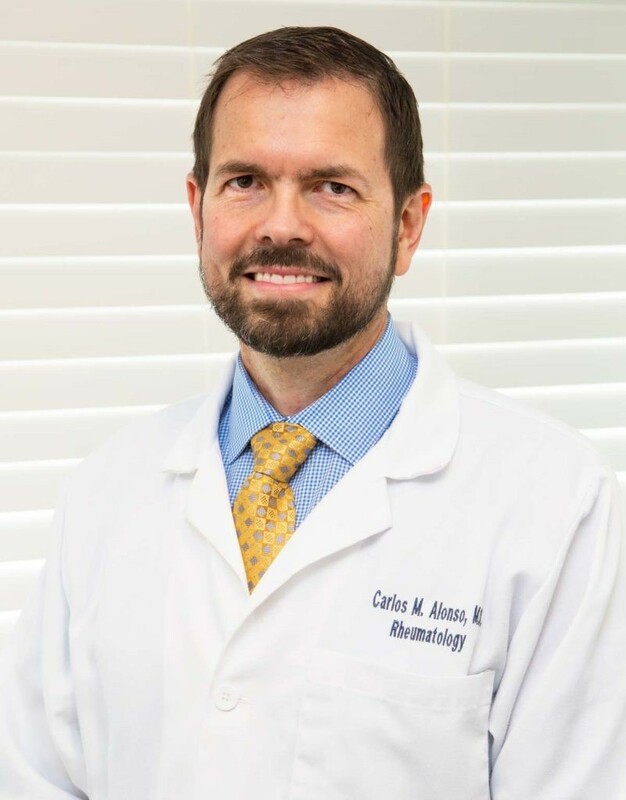 Born in Cuba, Dr. Carlos M. Alonso earned his medical degree at the University of Puerto Rico, School of Medicine where he was elected to the Alpha Omega Alpha medical honor society and received the Distinguished Student Award. He completed his internal medicine residency and rheumatology fellowship at the University of Miami/Jackson Memorial Hospital. Dr. Alonso has been involved in multiple research studies and is co-author on several publications. He started his private practice at the Mercy Professional Building in 2002. Dr. Alonso was the first rheumatologist in South Florida to use musculoskeletal ultrasound as an aid in the diagnosis and treatment of many rheumatic disorders. He was amongst the first group of physicians to achieve the Musculoskeletal Ultrasound Certification in Rheumatology – RhMSUS from the American College of Rheumatology. Dr. Alonso is board certified in rheumatology and internal medicine. To support Dr. Alonso or to join his team visit the Advanced Rheumatology of South Florida Team Page. 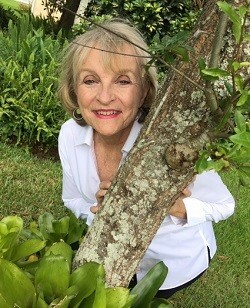 Helen is delighted to be selected as a 2019 Honoree for the Arthritis Walk at Tropical Park in Miami and as a participant in the March Advocacy Summit. In her career as a physical therapy clinician and a physical therapy faculty member, she has been an advocate for patients and their families dealing with all types of arthritis. As a patient diagnosed with both rheumatoid arthritis and osteoarthritis, Helen is well-aware of the many challenges that individuals may face. When Helen was diagnosed with RA 14 years ago, there was minimal support for her. Helen was already exercising regularly, eating a healthy diet, and meditating before she got the diagnosis. She read as much as she could from reliable sources, but the available information was predominantly discouraging and depressing. Since 2005, there have been a lot of encouraging developments in the management of RA with drugs and lifestyle management. However, the drugs continue to be costly and not affordable for everyone who could benefit from them. As an advocate, Helen hopes to encourage Congress to help make the best treatments available to all who need them. Helen looks forward to your support in this endeavor. Thank you! To support Helen or join her team, Team Yes. In May 2018 Marcy was diagnosed with Psoriatic Arthritis at the age of 38. This diagnosis came 6 months after she started having symptoms in both her hands with joint pain, throbbing, and swelling of the fingers. Marcy’s Mother Linda (in the photo with Marcy) has both Psoriasis and Psoriatic Arthritis as well. It was during this time Marcy first learned about some VERY important things. First, she learned what “Step Therapy” meant. Marcy has a unique field of work and she was not going to be allowed to go through step therapy’s traditional drugs such as Methotrexate (DMARDs). Luckily, once diagnosed Marcy’s doctor worked hard to get her approved for a Biologic Immunosuppressant to reduce her arthritis inflammation. Second, Marcy learned about the Arthritis Foundation, and the work they do to fundraise and raise awareness for arthritis research and advocacy, including advocating for law changes on requirements by insurance companies to mandate step therapy. Marcy’s doctor and she worked for about 6 weeks before getting approval without having to go through step therapy. However, Marcy watched her Mother Linda, as she was required to try less expensive drugs that have worse side effects before her insurance would approve her an immunosuppressant biologic. Last, Marcy learned about the annual Walk to Cure Arthritis and the local South Miami Arthritis Foundation support group. 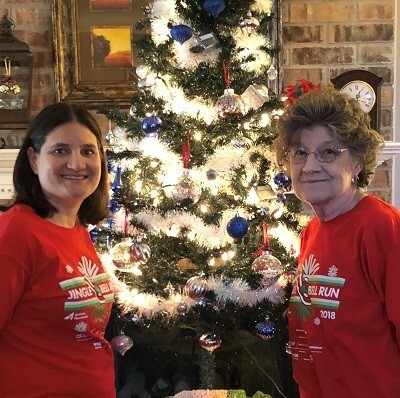 This great group of Arthritis Warriors has been encouraging and uplifting for Marcy as she began this journey navigating her “new normal” with living with Psoriatic Arthritis. Marcy looks forward to helping make a difference for all patients who battle arthritis. And she feels privileged to be an Adult Honoree for the 2019 Walk to Cure Arthritis in Miami. Support Macy in the fight against arthritis donate today!